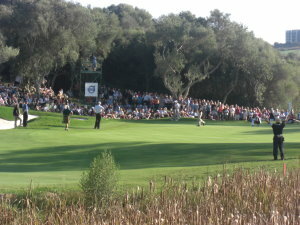 The One Million US $ “Golf Charity World Tour” (www.golfcharityworldtour.com) is launched October 8th at Finca Cortesin. The target of the “Golf Charity World Tour” is to raise at least ONE MILLION US $ for underprivileged children around the world. Golf professional Dr. Volker Bernhardt, also known in the golfing world as “Dr.Golf” is travelling to the best golf resorts and golf courses around the world to play against wealthy amateurs. The amateurs will put up money for the game and if “Dr.Golf” wins the money goes to Charity. As was the case at Finca Cortesin a sponsor can also contributeand invite friends or VIP clients for the game with “Dr.Golf”. With Carlos Beautell Largo, the new golf manager of Finca Cortesin, Volker was very fortunate as Carlos cares about children and liked Volker`s idea so much that he welcomed his players with open arms for the day. Carlos not only sponsored the greenfees but invited the players with guests and press for drinks and tapas after the game. Carlos speaks three languages (Spanish, English and German) so he even helped to translate during the press conference for the international audience. We would like to thank Carlos for his great effort and support for the event and wish him and his team all the best for the future. With Carlos, Finca Cortesin has obviously a very special human being and a great golf director for the club. Finca Cortesin is the “home of the VOLVO world match play Championship”, having twice been host to the worlds best golf professionals who met for one of the biggest tournament of the world tour calendar. During the tournaments “Dr.Golf”, also working as golf journalist, had the opportunity to talk to most of these elite golf professionals . 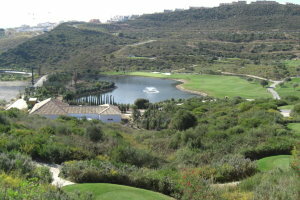 Feedback showed they found Finca Cortesin excellent, praising the fantastic fairways and very quick greens. The participants of the first “Golf Charity World Tour” event were Thomas Schwarz (sponsor), Dr. Wolfgang Schmitt (surgeon), Jade Prauner (Golf champion) and “Dr.Golf” (golf professional). Schwarz, an investment banker and main sponsor of this event is a relative newcomer to golf so a playing format was chosen, by mutual agreement, for eclectic match play. The three players and in this game as opponents of “Dr.Golf”, all played their shot. The furthest ball forward marked the position from which they all played their next shot. All the way to the hole. A tough playing format to win against because even out of three weaker players very often wonderful surprise shots can happen, shots not even a professional can copy to order. Saturday saw a game like this, applauded by the spectators but a headache for the pro. Fortunately “Dr.Golf” succeeded on the very last hole. A tough, fantastic match for all participants, combined with a great golf course, sunshine and a wonderful atmosphere. Great feedback all round leaving the question when is the next event. 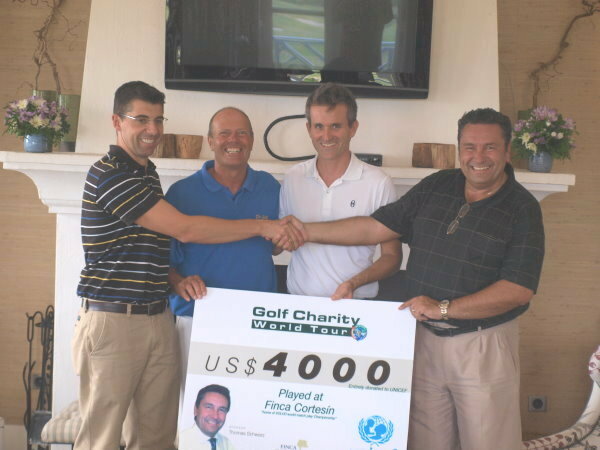 Salvador Pèrez Moreno, director from UNICEF Malaga received the US $ 4000 cheque during the press conference in the top notch Finca Cortesin club house. During his speech he mentioned that the money raised would allow a minimum of 100 children to be fed and taken care of for a whole month. Reason enough for Dr. Volker Bernhardt to continue the good work. In November 2011 he will travel to Dubai and Thailand with confirmed sponsorship. Up until then you also can have a charity game with “Dr.Golf” at your home club or his home base Los Flamingos. Experience with him a great day golf as well as doing something good for the underprivileged children on the world.